Class is now in session. Please open your fright books to page 237. Boy, will this bring back memories for you when you’re seventy. Monsters University does a rare thing with its premise that Pixar does with all of their movies: it incorporates real-world ideas and principles and relates them to the simplistic joys of a kids movie. Pixar isn’t alien to this concept: with WALL-E, you witness the effects of industrialism, with Up and Toy Story 3, the truth of loss and growing up. With Monsters University, we are given yet another truth, a truth about changing dreams and the pursuit of a higher education. It’s not as potent as Monsters Inc., but that’s another issue. 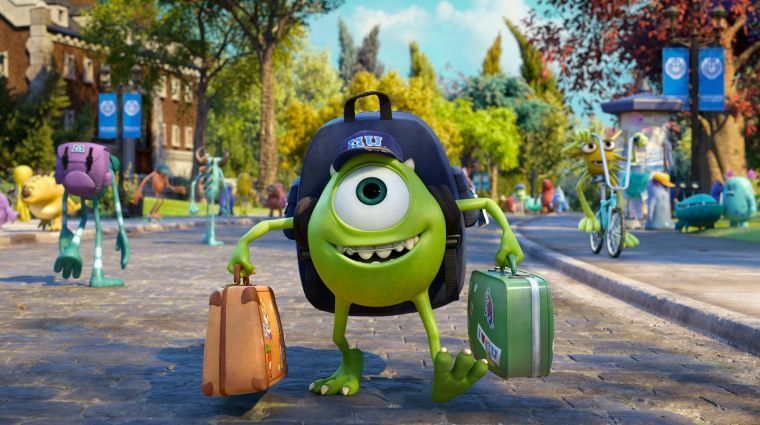 Taking place years before the events of Monsters Inc., Monsters University opens on a young Mike Wazowski (Billy Crystal), a punky little eyeball who dreams of growing up to be a scarer for Monsters Incorporated. His gateway into that dream lies in Monsters University, a college mostly known for its Scaring Program. This college is intimidating, a buidling filled with dark curtains, creaky floors, and echoed hallways, the perfect place for Scare students. I’d hate to see what the Art Department looks like on this campus. So Mike Wazoswki immerses himself in his studies and in his bookwork, determined to be the best scarer at the University. There’s only one obstacle in his way: James P. Sullivan (John Goodman), a cocky, overly-confident jock who thinks getting through college is about a big name and a big roar, which is about the only two things he’s got. In their first semester at Monsters University, Sully is showing Mike up in every single scare opportunity, and Mike shows Sully up on every test and oral exam. Monsters University chronicles their adventures together, from their chance introduction, to their rivalrous exchanges between each other, and finally, the unlikely friendship that forms in between them. Here is a movie that features the typical staples of a Pixar film: a good concept with a well-written plot, all forming together with fluid animation and wonderful voice-acting. Directed and co-written by Dan Scalon (The other two writers being Robert Baird and original Monsters Inc. writer Daniel Geirson), Monsters University is a story that combines clever, witty humor with that of a conventional, enjoyable story, even if it is at times a tad predictable. It’s easy to appreciate the humor in the film: even the names of Monster fraternities are enough to utter a chuckle. Admit it: how can you not smile when hearing the names “Roar-Omega-Roar”, or “Oozma Kappa”? This is the kind of cleverness in Monsters University: the kind that takes real-world truths and facts and parodies them in a children’s cartoon. I’ve always appreciated this about Pixar: they’ve always made their work smarter and more profound than other animated films, therefore allowing adults to enjoy their films just as much as the kiddies do. Whenever you see a slug-like monster rushing at slug-like speed trying to get to class, or seeing a brush0like monster put paint in his hair and go “Ker-Splat!” on a canvas, the cleverness and the humor cannot help but shine through the brightly-colored and textured animation in this film. Here, the monsters come in all shape, sizes, and breeds in University, and they plop, bang, clang, sneak, slither, and scare in all forms chaos and hilarity on the screen. Crystal and Goodman, of course, need no comment about the liveliness of their roles. You only need to see the first Monsters movie to understand how perfect they are in their voice acting. The important thing to remember here is that Monsters University is not Monsters Inc., and I mean that sincerely as a compliment. There is no doubt bits and pieces of Inc. that we can piece together in University; it’s charisma is intact, its wit and cleverness in-diminishable, and it cares just as much for its characters as Inc. does. What its missing, then, is not intelligence or technical efficiency: what its missing is heart. Or at least, as much as Monsters Inc. has. To illustrate my point, I bring up a pivotal scene from the original Monsters movie: remember the scene where Sully had to say goodbye to Boo? Do you remember the scene where he frightened her? Do you remember Sully playing with her in her room, telling her in his deep baritone voice “Kitty has to go”? Do you remember that when her door was torn to shreds, he kept one little piece as his reminder of Boo? And do you remember Mike piecing the door back together, turning it on, and letting Sully open it to find a little girl whispering “Kitty” on the other side? Do you remember the emotion? The heartbreak? The happiness? That “Aww” moment in Monsters Inc. is nowhere to be found in University. I’m not saying there isn’t emotion in there: there are plenty of deep and convincing moments of well-made drama between characters, and they are done well enough for us to be compelled to care for them. I’m saying the emotion isn’t done as well, or as effectively, as it was in Inc. to the point where I felt a deeper connection to the characters, almost as if I was in the room saying goodbye to my best imaginary friend. Someone might think I’m being unfair by comparing this prequel to the original, but that’s the game Pixar is playing here. Didn’t they know people would automatically look to the original when trying to decide which one is their favorite? But I digress. Monsters University is fun, intelligent, and dare I say it, relevant entertainment. The animation is as stellar as always, it makes its characters compelling, it sets them up properly in line for their inevitable trip to Inc., and it makes a funny connection in between the audience and their own college years. I strongly recommend you sign up to join the student body at Monsters University. Just make sure you stay away from the Art Department.